I was several hundred miles into my grand attempt to hike the Appalachian Trail, and the foot path in front of me had turned into a stream. It was raining. It was an El Nino year, and later we would learn that it would rain 28 out of 31 days. But for now, all I knew was that my socks were dry. And I was just doing my best to get through the rest of the day that way. I made my way up the trail, hopping from side to side, avoiding puddles and sticking to the high ground. A lot of money had gone into my water-proof boots and as long as I didn’t step into anything deeper than a couple of inches, I was good. 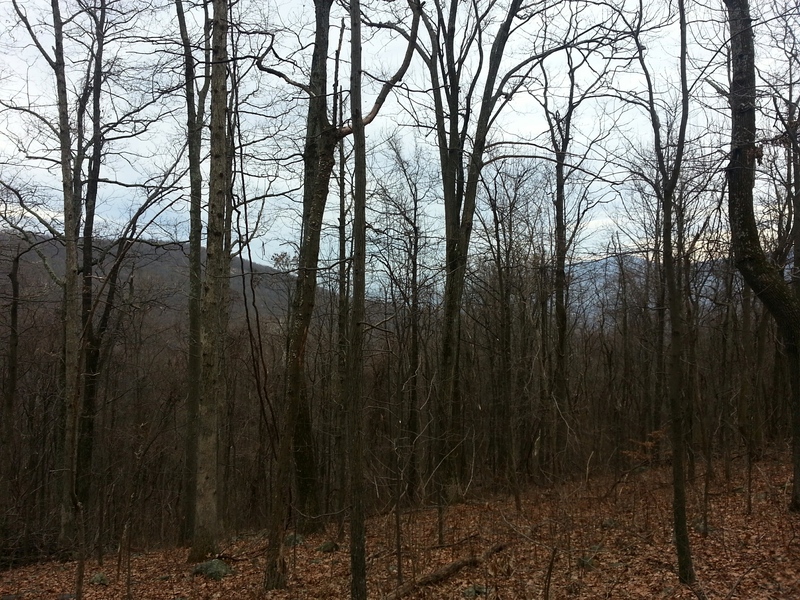 Halfway up an incline, I stopped to catch my breath and let a fellow thru-hiker pass by. He turned to me grinning and said, “You know… once your boots get wet, you are free”. He strode up the trail, and I stood there in surprise. We were miles from the nearest road or shelter, and the rain was predicted to go on for days. What was I doing? Was I really going to hop my way up the trail for the next ten miles? I stepped gingerly into the large puddle in front of me, letting the cold water seep in through my lace holes. I walked forward, picking up my pace, and realized… he was right. My feet were wet, but I was free. Free to walk with purpose and enjoy the views around me. And to splash through the puddles like a kid, smiling and dancing. It has been 12 years since that A.T. hike, and I have thought often about that hiker and what he said. How many times do we twist ourselves around, going far out of our way to avoid a perceived discomfort? And how much are we missing around us when we do just that? I don’t want to be so engaged with the effort of life that I miss the great stuff that is around me. There is nothing we hiker’s love more than a viewpoint, right? That beautiful cliff overlooking the valley, the trail in the hollow that looks up to an astounding waterfall… and this got me to thinking. These viewpoints bring me into such joy. But what I love most about being silent in the woods, what is really resonating with me, is that for that period of time I am completely and totally without a viewpoint! Without a personal viewpoint! There is no arguing my position, there is no trying to be right, there are none of the “yeah but” interactions that are so common in the “real world” when I am holding tightly to me and my point of view. And there is no stress. This tree doesn’t like me. I wonder if I just offended this tree? Look at that tree, it thinks it is better than me. 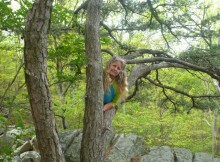 That tree is so very straight, and my posture is just terrible. That tree is no good. I don’t like that tree. You know the thoughts! They are pretty universal. The magic of trees is that they cannot hold my projections. All they can reflect back is… Love. Eternal, uncomplicated, love. And in being with them, they show me a deeper version of my true nature – who I am without all my stories about me, you and the world. And all I can find is a spacious sense of love. Me. The Trees. Simple. No mind. In the company of the trees, the pain of my addictive seeking of love and appreciation, my exhaustive scanning for signs of disapproval, and my endless story of me stops dead in their tracks. That is where I experience a peace beyond anything I have ever found. In the woods I am not trying to do something right, impress the trees, compete with the trees, get something from the trees, be something for the trees. I am purely and totally awake and alive as life itself, and in a way, I recognize that my essence is the same as these trees – free of all that noise. This may sound a bit airy fairy, but I am finding that it is just no small thing at all! All those strategies I have in life to get to the gold ring called happiness? They drop away in the company of the trees, and I can experience happiness right here, right now, instead of relentlessly seeking it. I can take in the good that is always all around me which is only obscured by my endless viewpoints, and right fighting, and opinions and fears and approval seeking and on and on and on. I can take this lesson of the trees with me back into the world of people and personalities. I can notice when I am missing a moment of pure happiness, of pure beauty, because I am in my head in a narrative of what I will post on Facebook about it to get your approval – and then I can return mentally to the moment and become present, like the trees. I can return to myself and reality. I can become aware of when I am not engaging with another human being because I have imagined, purely hallucinated, that the look they just gave me means they don’t like me, or the thing I just said offended them, or they should not be the way they are and I am better than they are, and I can return to sanity and join them at heart with no judgments, like the trees. And I can now catch myself arguing my point of view with my husband, my friends, the stranger on the street, and suddenly be able to stop in that moment and reconnect to the wonderful and amazing person before me and be a listener, a receiver, like the trees. And isn’t this connection really my deepest longing? 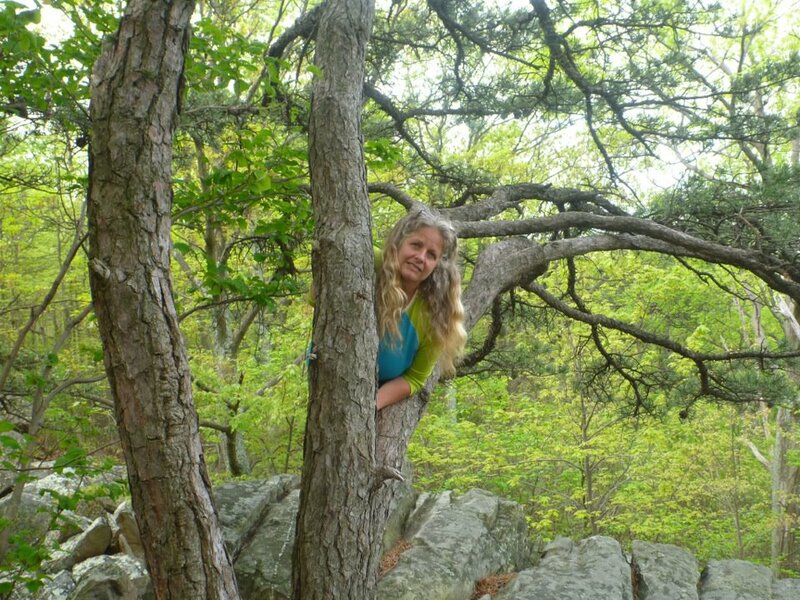 Hiking, with the Dames or alone in the trees, for me is all about connecting. The trees are teaching me about all the thoughts that get between me and my connection to the people, places and things that appear in my life journey. The things that nurture me and the gifts I have to offer in return. The trees show me, by giving me a place where all my inner-critic and judgey voices have nothing to stick to, what it is to be truly regal, and truly wise and open and solid and standing tall. The trees will give you everything you ever needed to know if you open to them. That is the one thing the trees can reflect back to us – and that is our own inner wisdom. They can be a remarkable doorway into that internal and eternal voice that knows exactly what to do in any moment. Including doing nothing at all until we know the next right thing, until the decision make us. How do I know this brings me answers from a higher internal and universal place and is not just the voice of my regular ole often un-reliable mind? Because the answers that come are sometimes so startling, so much something I did not think of previously, that I am stunned! ”I never thought of that!” is a common refrain when I get sill and listen for the Wisdom that comes from this still, sacred place and it is the trees that show me where to tap into it. So If I were to have a guru, it would have to be a tree; they do not charge for a workshop, have an hourly rate, they will receive our joy or our shame or our weeping and wailing with nothing but open limbs, they have no book to sell us, no agenda to run on us, and no Velcro for our projections to stick to. Will I fire my therapist now? No, probably not. But who knows? I really just wanted to go for a walk. I really just wanted to lose some weight. I really just wanted to find out what it was to be in a collective of women. 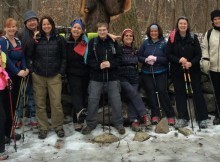 So I signed up for a hike with the Dames in 2011. And yet, as I write this I am so aware of the truth – that I got so much more than I bargained for! In deepest gratitude and awe for all my sisters, in the woods and beyond. I thank you a thousand times and then again, for being my trees. I love the phrase hike your own hike. But in this group, we are primarily a sisterhood and we hike as a group. The front group watches out for the back group and vice versa. We leave no one behind. I like to say, if a vigorous workout and clocking miles is your primary goal, you may be in the wrong group! What I treasure most about our Chapter is that we create a space where women who don’t think they can do this, can find out that they can – in a loving and supportive way. 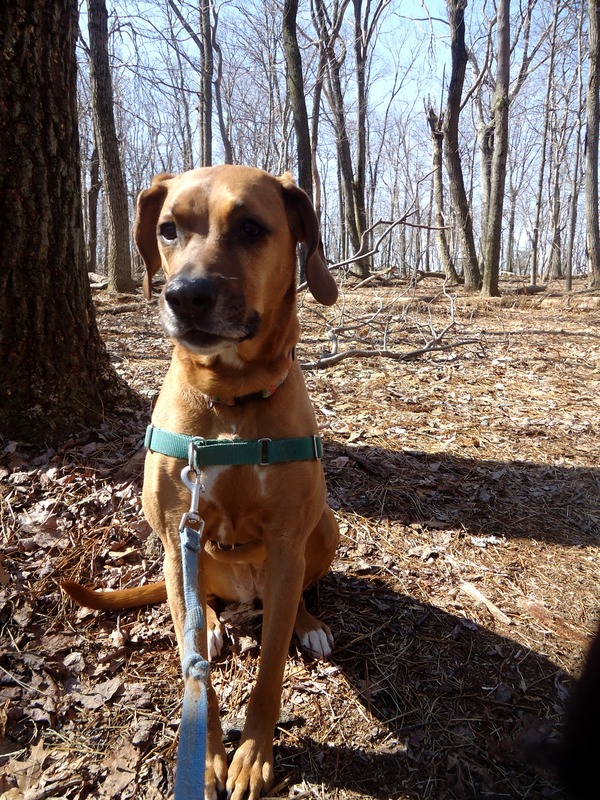 I was 220 pounds, depressed, and scared to death on my first hike with the Dames in 2011. Yet I knew right away that the primary purpose of this group was to invite me into the woods, and into my own greatness, and to support me to do that. I was hooked. Something in the woods rhymed with who I am at such a deep level, something I had lost connection with. I felt some grief about that. I really did. Even a little shame. But mostly? I felt that White Blaze Fever take me back to the trail to sing my song! To start to know the words. And that shame woke up into a deep passion for life, inside and outside of the woods. And today I DO go for vigorous hikes and clock miles and I love that! I even do it with gals I met here. 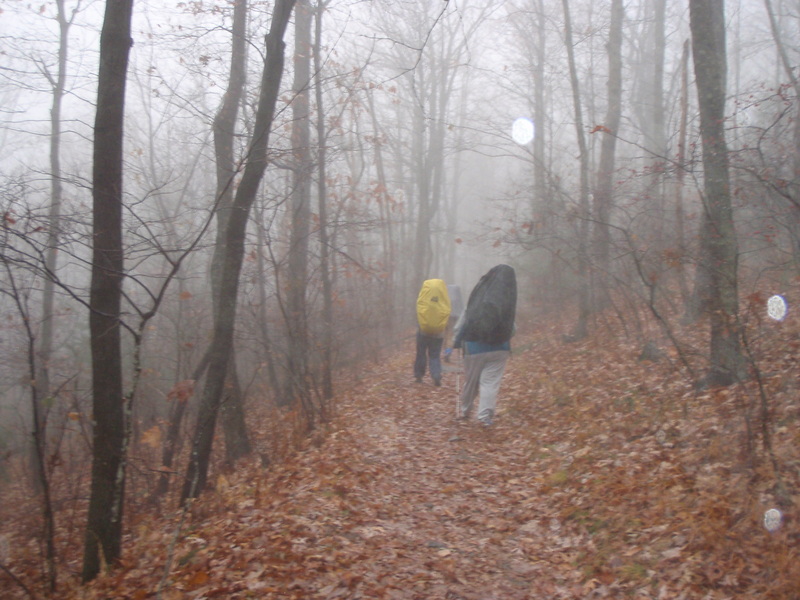 But except as otherwise noted on our Dynamic hikes, I carry on our primary purpose – to let each woman know that the woods are for her, too. And if I ever feel, “Oh God, I want to go faster, this is a waste of time, I am not getting a good workout”, I remind myself of how great the gift I received from this group in 2011 truly was. And I remember that I am the luckiest girl in the world to be able to give it back. And that the newest newcomer knows more about humility than I do in that moment. And that I am the luckiest girl in the world to receive THAT gift in return. Loving and supporting other women is what teaches me to love and support me. Its a full-on win. And hearing how moved everyone was last week, during a tough ice hike with lots of newcomers, how we pulled together, it was clear to me that what we all longed for, more than a strong slim body, or the ability to bag a peak, was the connection to each other, the experience of trust and encouragement among women, and the opening of the heart that this brings. It being Valentine’s Day this week, I am reminded that in all these things, The Trail Dames has allowed me to open my heart to other women, so that I can find my own true love, at home, inside myself. There is No Greater Love than that – for in that discovery, we are able to reflect it back to the world. And the World becomes our Valentine! Keep Your Backpack Side Up! You can enjoy as much of these foods as you like. Remember we are not counting calories or fasting or anything like that! Meat and Poultry: beef, lamb, chicken, duck, pork, wild game, venison, etc. When you can, use free-range chicken and grass-fed beef but don’t get wrapped up in it if it’s not feasible. Don’t be afraid to eat all parts of the meat. Don’t limit yourself to boneless, skinless chicken breasts. Fish: All fish is good but especially fatty fish like salmon, sardines, mackerel, and anchovies. Wild is preferable. Eggs: These are perfect and portable (when boiled, that is)! Eat the whole egg… if we weren’t meant to eat yolks, chickens would have egg separators. If it’s affordable for you, buy free-range but again, don’t get wrapped up in this detail. Starchy Tubers: Yams, sweet potatoes, plantains, yucca… for now, white potatoes are not as good a choice as the others. Traditional Fats: Use leftover fats from cooking (beef tallow, chicken fat, bacon grease), Coconut oil, and olive oil. Also butter, but on this one splurge for the organic/grass-fed stuff. You can eat these foods, but not big portions and not multiple times a day. Pretty much once a day, reasonable portion is good here. Processed Meats: Sausage, uncured bacon, jerky, salami, turkey or ham… here’s the thing, though, CHECK THE INGREDIENT LIST. You want them to just be meat, no added fillers and sugars and junk. Whole Fruit: Let me say first, there is NOTHING wrong with fruit. Nothing. We say moderation simply because fruit does elevate the blood sugar and we want to try to keep the blood sugar even and consistent. Dried fruit is not optimal but fine in a pinch. Stick to a variety of fruits in their natural state. Nuts and Seeds: sunflower seeds, almonds, brazil nuts, macadamias, pecans, pine nuts, pistachios, cashews, chia seeds, pumpkin seeds, sesame seeds. Peanuts are legumes and should be eaten very sparingly. Try to keep to one handful a day. Coffee: All tea and coffee are permitted. Try to limit the caffeinated (coffee and black tea) to 1-2 cups and before noon. Any later interrupts sleep no matter how well you think you handle caffeine. If you struggle with depression, mood swings, insomnia, anxiety, or hypoglycemia you will greatly benefit from eliminating coffee and caffeine in general. Dark Chocolate: 70% cacao or higher and in small amounts. Read labels and try to purchase the one with the least ingredients. If you are sensitive to caffeine, keep this earlier in the day. Vinegar: apple cider, balsamic, red wine, etc. apple cider vinegar has some especially beneficial properties. Try making your own salad dressing. Full Fat Dairy: Really, once a day or less here. It must be full fat. If we were intended to eat reduced fat, cows would come with cream separators! This is a place to eat grass-fed and organic, as well. Grass-fed/organic dairy provides healthy omega 3’s not found in other dairy. If dairy is easy for you to eliminate, we recommend doing so. For best results, avoid these foods altogether. If you do eat them, no more than once or twice a week. Grains: This means oats, rice, bulgur, wheat, quinoa, pasta, bread. If you want to have some grains, go with quinoa or rice. Avoiding wheat, bread and pasta is highly recommended. Sugar and Artificial Sweeteners: We are trying to get blood sugar under control and both of these wreak havoc on the body. If you need to sweeten something, try pure maple syrup, honey, palm sugar, or fruit/fruit juice. But limit it! Alcohol: Relax. It’s just for now, for this month. Limit the alcohol to 1-2 times per week or for best results altogether. This list is not a complete list but should give you a great guide to work from. Build meals around the foods in green with a spattering of foods in orange. Becca Wroten’s personal journey in life has been greatly linked to sports and fitness from a young age. As an adult, she realizes the greatest things in life come from hard work, perseverance, and courage. It is this belief in the tenacious spirit and a love for movement that drives her program design and the design of Haka Fitness. First of all, let me say that I have not always been a fan of winter hiking. In fact, up until a few years ago, as soon as that first cold wind blew, I went into hibernation mode, staying inside nurturing other hobbies like reading, sewing, drinking hot chocolate…embracing the chunky until Spring came around again. I don’t know when it changed. Trail Dames had something to do with it for sure. 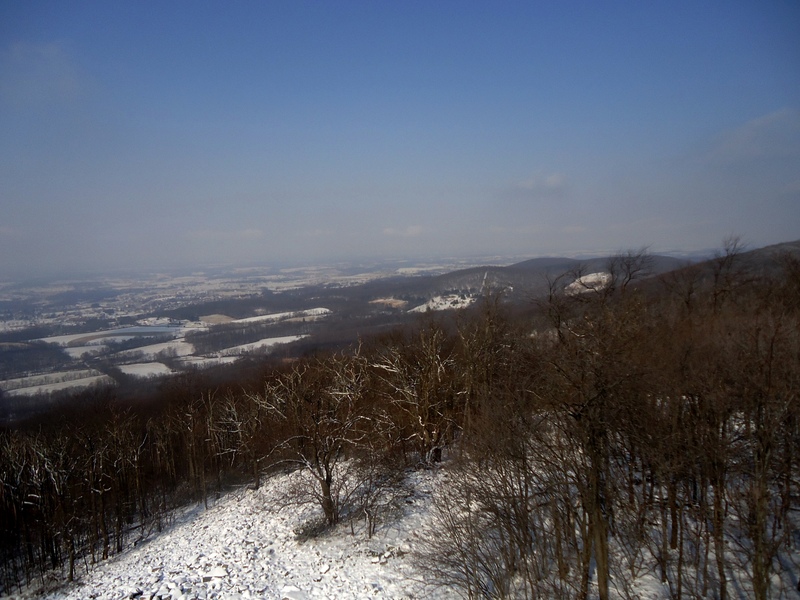 I found out I could and would hike in winter IF I just signed up to attend a hike with Trail Dames. Fast forward to NOW! 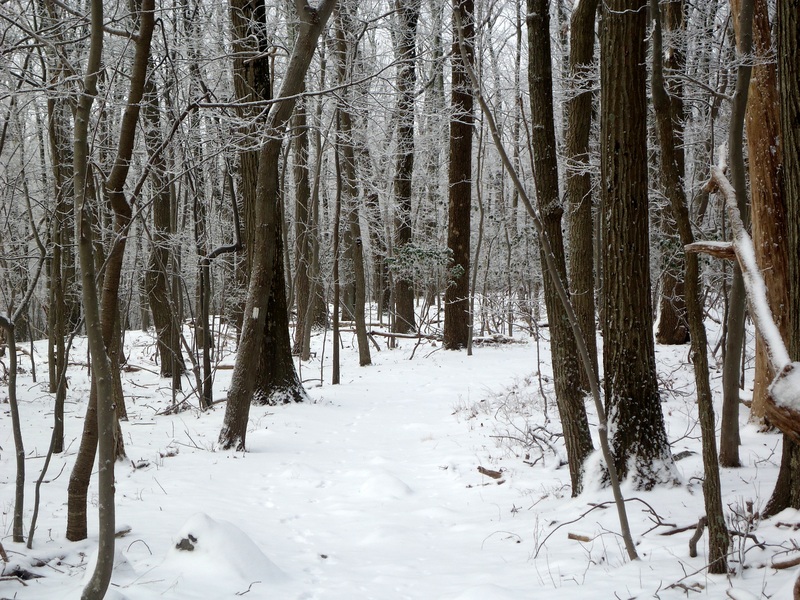 I love winter hiking. The silence, the crunch of snow, the briskness of the air, NO BUGS, NO STICKY HOT HUMID AIR!!! And the views! I can see through the trees and see the distant mountains! But to love it I had to figure out how to happy in the cold. That was my challenge! Start with a moisture wicking base layer on both top & bottom. I have a lightweight base layer and a heavyweight base layer. If the temps are 30 – 50 I use the lightweight, anything below 30 and I choose the heavyweight. It is a matter of choice…and only experience will tell what is comfortable for you! For my legs, after the base layer, I put on wind pants (like gym pants). 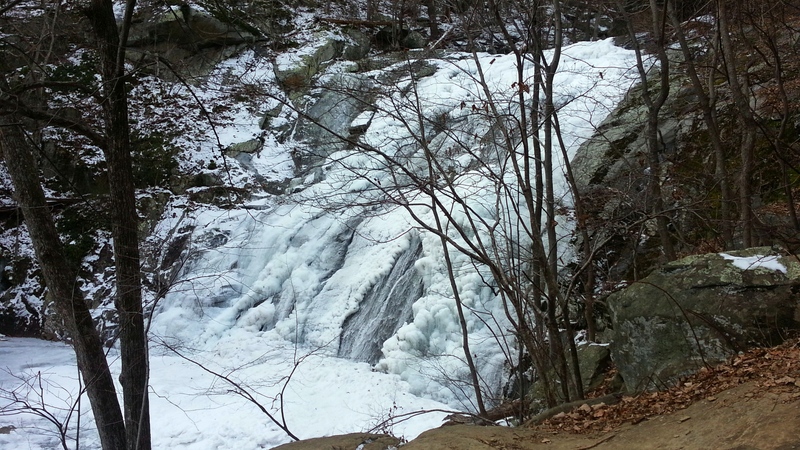 This is enough on bottom for 99% of my hikes here in the MidAtlantic. For the other 1% (when it is God-awful skin lashing cold) I put fleece pants on after the base layer, then the wind pants. For my core (top), I follow the base layer with a typical short sleeved hiking shirt. Then a long sleeved hiking shirt with a hoodie, then a fleece jacket, and finally a wind breaker. That wind breaker is a key piece of the layering for me. Wind can flippen freeze me to death…Do not underestimate the power of wind chill. Okay, now let’s talk about head wear, and yes, you better have a good hat. Not some chintzy piece of crap made out of fibers that won’t keep you warm. Try a good wool hat…know why? Because wool will insulate even if it gets wet! Also, make sure that hat pulls down over your ears, or even better, invest in a balaclava because you are going to need something around your neck! My hands are covered with glove liners as well as a heavy glove. For my feet, I just use my usual wool hiking socks with silk liners and a waterproof hiking boot. My feet generally stay plenty warm (sometimes they even get hot). So you are all layered up nicely and ready for your first winter hike! Where do you go? 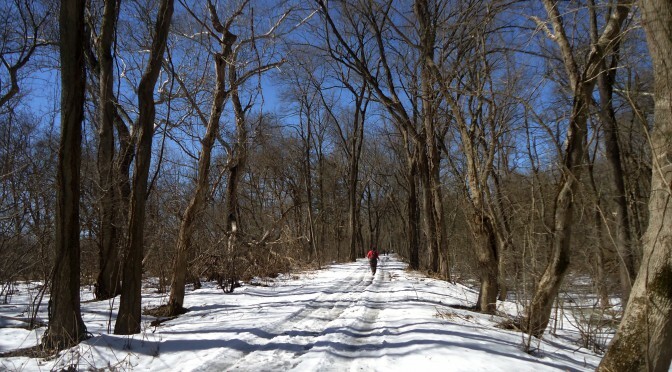 My advice, so you can try out your layers is to pick a route, either on a trail or in the neighborhood, that is around two miles. In two miles, you will know whether your layers need adjusting. You do NOT want to find out that you have inefficiently layered on a long hike!! If you get too warm, that is fine…because you can shed a layer or two as you warm up. But if you are too cold, then you need to start off with better layers…either heavier weight or more layers. Okay, the layers are working, yay! What’s next? Let’s talk about water and staying hydrated. In the winter you may not feel as thirsty as you do on a hot summer day. 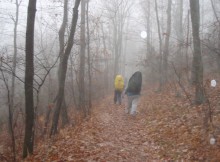 You might need to force yourself to take a drink of water as you hike down the trail. Camelbak has a neat hydration calculator you can use to give you an idea of how much water you should be taking in as you are hiking. 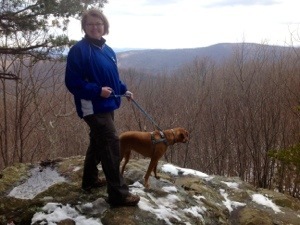 Not all winter hikes are snowy…30 degrees…Sidekick Pauli takes a break in Gambrill SP! Definitely! 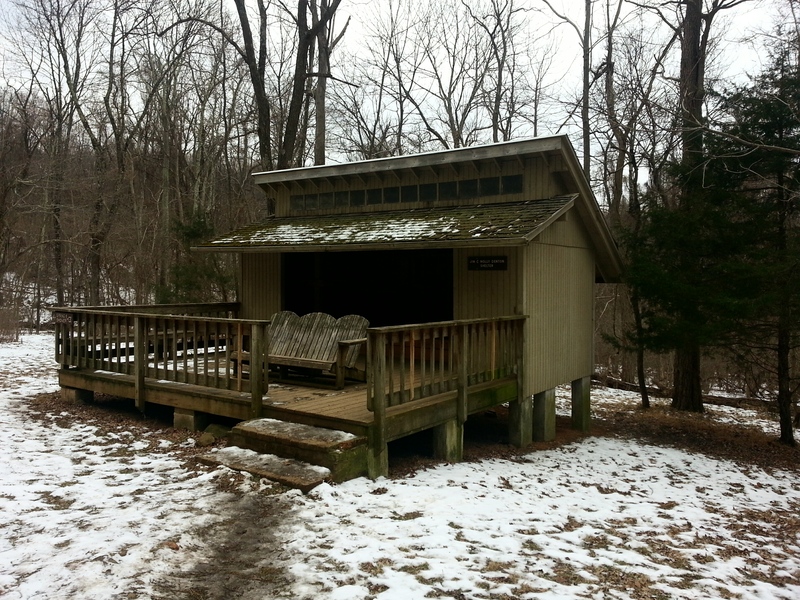 I usually hike on the Appalachian Trail, so there are shelters where I can stop, get out of the wind and relax while eating my lunch. Try to plan your hike so there is a good break place in the middle somewhere. If it is super cold, an emergency blanket can keep you comfortable so you don’t have cut your break short. Jim & Molly Denton Shelter on the AT in VA…Nice break spot. In addition, take little breaks along the way. You might want to take along a pad to sit on…otherwise you could find yourself sitting on an icy log or in the snow!! 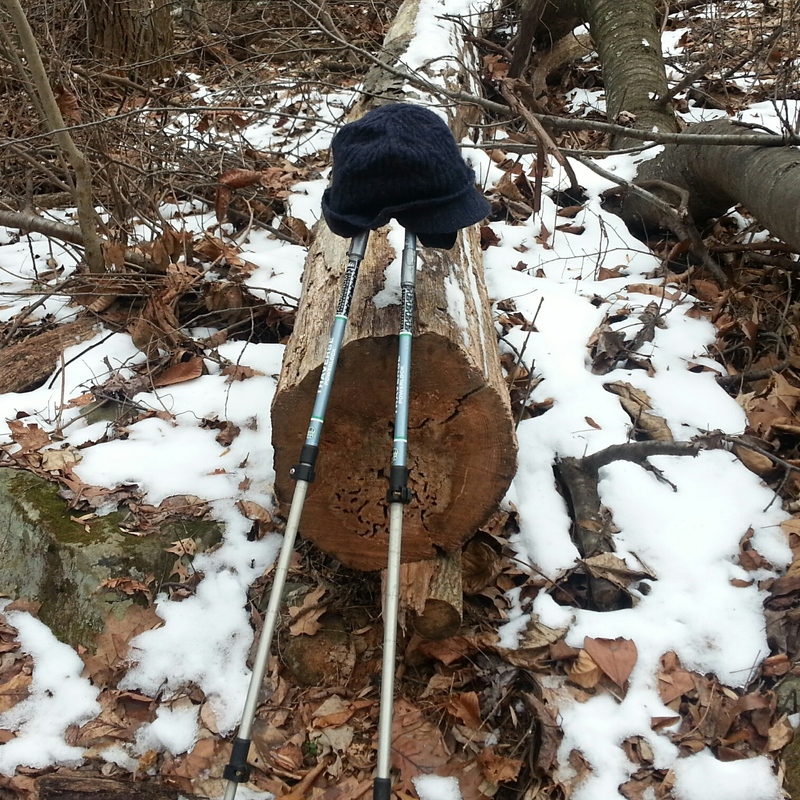 Sometimes I get so warm hiking some of the layers come off…like my hat and gloves. That’s it! Seems like a lot, but with each hike out the prep gets easier! I usually keep many of these items handy, either in my pack or a designated drawer in my dresser so they are ready to go when I am. Have fun, stay safe and Hike on!